Although traditionally, the Poisson’s ratio was always assumed to be positive since most everyday materials get thinner when stretched, today, it has been shown through numerous studies that negative Poisson’s Ratio materials exist, meaning that referring to Fig. 1b, for the XY-Plane, a uniaxial load in the X-direction results in an extension in the Y-direction. 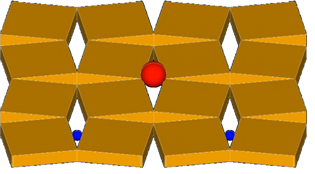 The existence of these materials confirms what had been predicted by theory for a long time: the theory of elasticity states that the Poisson’s ratio for three dimensional isotropic materials may range between -1 ≤ν ≤ +0.5 while for two dimensional isotropic materials, it may range between -1 ≤ν ≤ +1, with no upper or lower bounds for anisotropic materials. Several terms have been coined to describe these counterintuitive materials including Auxetic, ‘anti-rubber’, dilational and ‘self-expanding’, however, today, the term auxetic is mostly used. Real interest in auxetic materials begun in the late 1980s and early 1990s following work by pioneers in the field of auxetics such Professors Ray Baughman, Kenneth E. Evans, Lorna Gisbon, Anselm Griffin, Rod S. Lakes and Krzysztof W. Wojciechowski who produced the earliest samples and models of auxetic materials. In fact, prior to the extensive work by these academics, there had only been a handful of reports of this behaviour and little was known on the mechanism which could result in such anomalous behaviour. With all the auxetic materials discovered so far, the negative Poisson’s Ratio can be explained by the intrinsic geometry of the micro or nanostructure of the materials and the way that this geometry deforms on the application of a stress. In fact, over the years, various geometry based deformation mechanisms have been proposed to explain the auxetic behaviour in various naturally occurring auxetics (such as α-cristobalite, cubic metal crystals and zeolites) and man-made auxetics (such as micro and nano structured polymers and foams). Auxetic behaviour is scale independent and the same combination of geometry and deformation mechanism can operate at any level. For example, it is now recognised that mechanisms based on rotating rigid units, can be build in the macro-scale as a structure, has been used to explain auxetic behaviour in foams (i.e. in the micro-scale) as well as to explain auxetic behaviour in a number of silicates and zeolites such as α-cristobalite and natrolite (i.e. in the nano-scale). A negative Poisson’s Ratio imparts on a material several enhanced characteristics such as an increased shear stiffness, increased plane fracture toughness and increased indentation resistance. The increased indentation resistance results from the fact that in auxetics, the bulk of the material flows to the zone of impact making them denser, contrary to conventional materials whereby the material flows away from the zone of impact. Auxetic materials are also known to have better shock and vibration absorption properties. 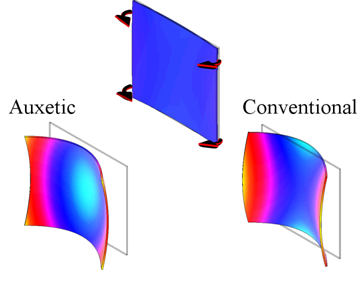 They also have a natural tendency to form dome-shaped double-curved surfaces (Fig 2), unlike conventional materials which tend to form saddle-shaped surfaces. Auxetic materials may be incorporated into composites to produce materials which benefit from the enhanced properties associated with negative Poisson’s Ratios. For example, sandwich panels produced from an auxetic honeycomb core material (which is very soft) bonded to outer surface layers of a conventional fibre-reinforced composite laminate material (hard) result in a hard material which can form dome-shaped surfaces. Such materials are particularly desirable in applications that require highly curved hard surfaces, such as those found in the body parts of aircrafts and cars. 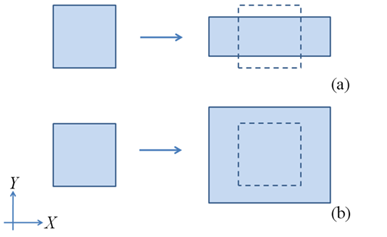 Figure 2: The bending behaviour of a conventional material and an auxetic one. Auxetic materials and structures can also be used to replace conventional components in various products used in specialised applications to produce higher quality products. For example, auxetics can be used to make ‘smart filters’ (Fig. 3) where the pore size of the filter can be changed by varying the applied load thus controlling the size of particles that can be allowed to pass through the filter. This also permits easy cleaning of clogged filters. Auxetic materials have also found their place on the operating table: a dilator for opening the cavity of an artery or similar vessels made with an auxetic component has been patented for use in heart surgery and related surgical procedures. In this application, the coronary artery is opened up by the lateral expansion of a flexible auxetic PTFE hollow rod or sheath under tension. These are just a few examples that demonstrate how auxetic materials can be used to develop and manufacture new or improved structures and products that could become commercially available in the near future.